"articleSection" : "With enormous advantages of Japanese used cars, the question is how on earth they come with cheaper prices? Their is a reason why Japanese used cars are cheap and available in great amount. When people purchase a new car in Japan, their first inspection is good for first 3 years. ", "articleBody" : "After this, they must have second inspection checked every two years. The main reason consumers in Japan prefer to purchase new cars as compare to other consumers in the world. Japan wants to save resell cost and export Japanese used cars, with strict inspections. The result is huge amount of Japanese used cars to be available in the country without the required number to purchase them. Japan has massive car export industry with hundreds of car exporters that operate within it. The main market for Japanese used cars is Europe, Africa and Caribbean countries. Now, why Japanese used cars come in cheaper prices in your country. In Japan, people tend to purchase new vehicles frequently inline with the new Japanese car models are launched in Japan. It carries their old but very well maintained Japanese cars to be available and sold at lowest prices. You can check hundreds of quality Japanese cars at cheap prices in Our Stock too. This is the reason Japanese car inventory gets doubled and enable them to export as many cars around the Globe. Normally, you have to find a local agent who gives you access to Japanese car auctions. You select the car and settle for a bid, the agent marks your bid and you win the car. Also, you need an export company to ship the car with all necessary documents. You have to pay the invoice and freight cost. 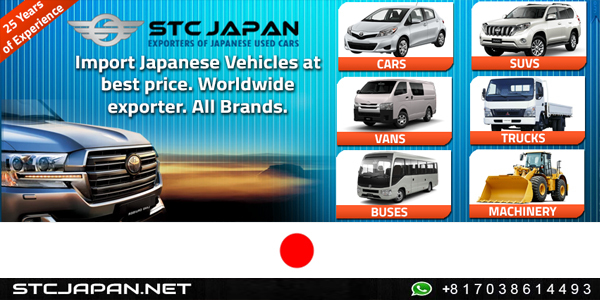 At STC Japan, The car purchasing process is on your fingertips, we have already done the hard work for you, you have to simply choose your desired car, order online, pay through wire transfer, and we ship the car which normally takes a month. Our professional sales staff will keep you informed of the status and required information during the shipment. Most car buyers are loving to import cars directly from Japan through the internet. The reason is they purchase high quality cars at reasonable prices. Every car consumer is aware about Japanese used cars sold cheaply over the world. You get Japanese used cars with complete accessories and necessary parts, which enable you to have profitable and hassle free deal. Japanese used cars are sold in high quality condition due to strick inspections in Japan. Most of them will look like brand new cars. With enormous advantages of Japanese used cars, the question is how on earth they come with cheaper prices? Their is a reason why Japanese used cars are cheap and available in great amount. When people purchase a new car in Japan, their first inspection is good for first 3 years. After this, they must have second inspection checked every two years. The main reason consumers in Japan prefer to purchase new cars as compare to other consumers in the world. Japan wants to save resell cost and export Japanese used cars, with strict inspections. The result is huge amount of Japanese used cars to be available in the country without the required number to purchase them. Japan has massive car export industry with hundreds of car exporters that operate within it. The main market for Japanese used cars is Europe, Africa and Caribbean countries.